In recent years, it has become increasingly clear to manufacturers and distributors that B2B eCommerce software is a must-have to reach an evolving customer base that prefers online purchasing. As the need for B2B eCommerce continues to grow and suppliers implement software to meet their customer ordering needs, it is important to proceed thoughtfully and thoroughly. If your B2B company has firmly decided that B2B eCommerce software is a necessity to achieve your revenue goals, it is crucial for you consider how you will go about configuring and setting up your B2B website. ‍In my experience as an Onboarding Specialist at Handshake, helping hundreds of suppliers like you implement B2B eCommerce software for their businesses, I find it’s helpful to slow down and fully consider this question: What is your reason for B2B eCommerce software? ‍Every business is unique, so the answer to this question varies widely from person to person, but the most common answers tend to fall into one of three categories. Easing the burden on sales reps. Your in-person or in-office sales team cannot possibly service every customer at once. For sales teams that are struggling to keep up with the pace of customer ordering, B2B eCommerce is welcomed relief. Enabling customers to place orders on their own, however, can sometimes make reps feel as if they are no longer needed. To counter this perception, make sure to involve your reps in the B2B eCommerce software selection and implementation process early and often, and let them know the various ways they can work hand-in-hand with your online ordering channel. Cutting order processing costs. For growing companies without an online ordering solution that’s integrated to their back office systems, data entry staff are often inundated with customer orders to process. B2B eCommerce software solves this issue by syncing self-service orders directly to back office systems, such as your ERP, eliminating the need for redundant order entry processes. Better inventory access. B2B eCommerce software will automatically integrate with your inventory management software, such as Dear Systems, with inventory levels automatically adjusted the moment orders are submitted. While B2B eCommerce software alone will not manage your inventory, many suppliers find it gives them enough inventory features to do the trick, leading to greater inventory access and relieving your buyer and back office staff frustrations. Interestingly, “to increase sales” isn’t always the answer we hear to the question of “Why B2B eCommerce,” even though it is the most significant benefit of launching a B2B website. B2B eCommerce software implementations are often accompanied by a significant bump in sales, since the ability to process more orders and increase product discoverability is characteristic of self-service ordering channels. Understanding the deeper reasons behind your company’s B2B eCommerce software decision will help you challenge the status quo, which, conveniently, is the next step to B2B eCommerce implementation. ‍Your company is getting ready to shake things up in a big way by putting B2B eCommerce software in place, so why not take this unique opportunity to holistically reevaluate your sales infrastructure while you’re at it! Larger companies often fail to realize the full breadth of their business workflows when they start to implement B2B eCommerce software. Of course, the right solution will be able to handle even the most complex business rules you can think of (this is a big reason why B2C and B2B companies require different eCommerce solutions), but maybe it’s time to rethink these complexities. For instance, many companies I work with sell thousands of SKUs. Businesses that have historically sold through sales reps only often find themselves juggling hundreds of thousands of customer-specific prices when beginning to implement B2B eCommerce software. That’s a lot of prices! Instead, it’s easier to organize your various buyers into tiered pricing brackets. This way you can continue to offer your top accounts premium pricing, while reducing the complexities that tend to slow down B2B eCommerce software implementations. Standardizing your pricing into brackets will also ensure that your sales reps are not offering different prices than what’s listed on your B2B website, which will serve to hinder customer adoption. Next, you’ll want to consider the state of your data, how it is stored, and whether your current ERP is getting the job done. ‍Any B2B eCommerce software solution needs to be able to connect to your back office data seamlessly in order to provide customers with the product, pricing and inventory information they need to make informed purchasing decisions. Setting yourself up for a successful ERP integration before you implement B2B eCommerce software will help make the whole process run as smooth as possible. As you evaluate B2B eCommerce software vendors to take on your project, make sure to ask if they have experience integrating with your specific ERP. The best software vendors have out-of-the-box integrations with the most popular ERPs and accounting systems—such as Netsuite and Quickbooks—and will be able to implement custom integrations upon request. Once you ensure a vendor’s integration capabilities with your ERP, there are multiple ways for the two systems to speak to one another. Methods range from simple exporting and importing of CSV files, to full-blown API integrations that allow for real-time communication between both systems. Considering the size and scope of your IT department, you’ll have to decide which integration type makes the most sense for your business. Preparing for this decision before vetting B2B eCommerce software options is highly recommended. Are all your products up to date and reflected in your ERP? Have you retired old items by marking them as inactive? Are all your customer records up to date? Have your sales reps entered all their account contacts into your ERP system? Are you tracking inventory in your ERP? If so, do your inventory quantities appear to be accurate? Bottom line—the better shape your data is in, the easier it will be for B2B eCommerce software to do its job and get buyers placing orders online. After your B2B website is fully integrated with your ERP, you’ll want to fully consider the user-experience of your buyers. ‍The best off-the-shelf B2B eCommerce software allows you to set up digital catalog browsing to your specifications, such as accommodating various levels of categorization, filtering and even company branding. 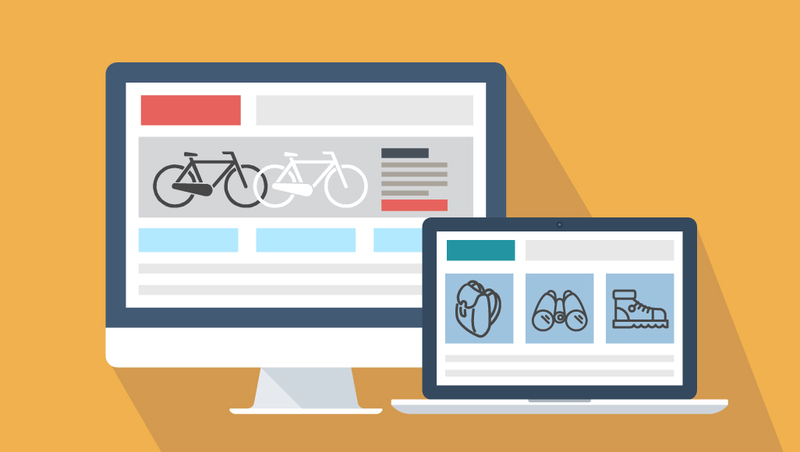 While exploring the many options available to you, remember that any decision regarding the front-end of your B2B eCommerce website should be made with your buyers in mind. ‍You’re trying to simplify ordering, not complicate it. 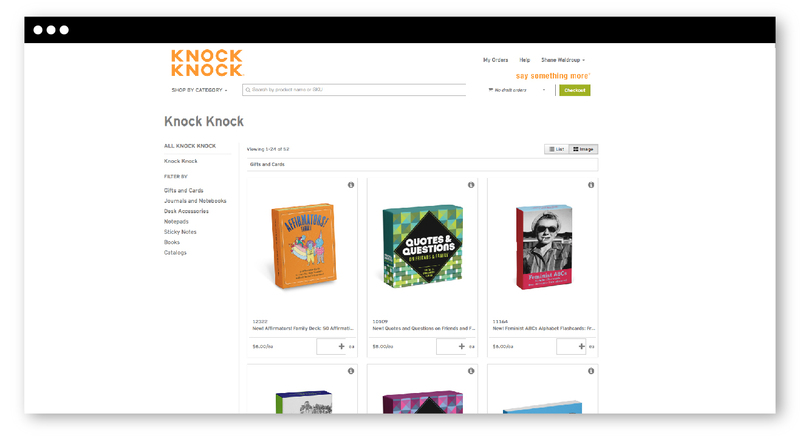 It’s easy to get carried away when categorizing your products for easy browsing. The old adage “less is more” very much applies here. Your buyers think of your products in broad terms, so your categories should be just as broad. For instance, if you’re an apparel brand, you may not need a category for sneakers, boots, shoes, and sandals. Instead, it’s best to generalize this category as footwear, then provide filters within the category to narrow search results. Not only will this simplify the purchasing process for your buyers, it will allow the opportunity to get even more products in front of them that they wouldn’t have otherwise stumbled upon. Custom fonts, colors and logos give Who’s There Group’s B2B site catalog a branded look that’s simple and easy to navigate. Getting your B2B eCommerce site set up with your company’s specific selling rules, cleaning up and integrating your product and pricing data, and customizing it to fit your needs is a great start, but if you don’t tell your buyers to start using your B2B portal, it would all be for nothing. Before implementing B2B eCommerce software, it’s important to first consider how you will market this new ordering channel to your buyers. To help you along, we created a robust B2B eCommerce Adoption Guide that you should feel free to reference as you implement B2B eCommerce software at your company. We recommend three easy ways to let customers know about your new B2B eCommerce software, right off the bat. ‍One. If you also sell through in-person sales reps, use them to spread the word about your new B2B site. As long as you commission them on all sales made on their accounts through B2B eCommerce, they’ll be happy to help you enable self-service ordering. ‍Two. Communicate the good news with them over email. If you do not have an email marketing platform, consider using MailChimp. Handshake’s simple integration to MailChimp makes it easy to communicate the launch of your B2B site, as well as raise continual awareness for new product releases. ‍Three. Offer exclusive deals and discounts to first-time users of your B2B site. If you implement the suggestions in this blog post, trust me, they’ll never want to order from you another way after they place their first order! Don’t allow your current pricing structure to slow you down. Organize your prices into standardized tiers to ensure easy implementation of your B2B eCommerce software. Make sure your data is up to date and in working order. Retire old SKUs that are no longer in use and audit your data to make sure it is organized and easy to update. Consider ERP solutions that will make your life easier! Don’t forget to let your buyers know about your B2B site. While some customers will seek out your website’s wholesale login button on their own, others will need some extra help. Of course, if you’re still looking into B2B eCommerce vendors, we’d love to be in the running! Set up a 10-minute call with a Handshake specialist to find out if Handshake Direct, our B2B eCommerce software can meet the needs of your customer ordering channel. I wish you the best as you explore the possibilities of B2B eCommerce software for your business.